The North Bank of the River Tyne has been home to Shepherd Offshore for over 50 years. The extensive marine and manufacturing facilities at our Offshore Technology Park and Neptune Energy Park currently handle over 150 vessels a year, transferring over 133 reels by road between our facilities. Our services are available 24-hours a day and seven days a week, 365 days a year (subject to notice and agreement). Shepherd Offshore’s policy of continued development and improvements to infrastructure have regenerated both the Offshore Technology Park and Neptune Energy Park. As a result, we maintain high levels of activity in support of the world-class manufacturing companies that now operate on our sites along the North Bank of the River Tyne. Shepherd Offshore’s world-class riverside facilities provide over 1500m of deep-water quay frontage, supported by 25-hectares of high-capacity quayside and open storage areas across our sites. We provide our customers with a full turnkey solution for the mobilisation and demobilisation of our vessels. Our turnkey solution is supported by our marine services, vessel fendering, mooring and embarkation teams, together with lifting and handling support, project management, storage, warehousing, transport, sea-fastening solutions, fabrication and engineering. The Port of Tyne provides Vessel Traffic Services (VTS), pilotage, surveying services, and tidal information – all of which are vital elements in overseeing safe navigation on the River Tyne and in protecting the environment. Tyne VTS also controls and coordinates shipping movements, pilotage and towage. Their hydrographic surveying and dredging operations ensure the maintenance of channel depths. For more information, please contact Port of Tyne. It’s approximately 4.5 nautical miles to our berth at the Offshore Technology Park, upriver beyond the Neptune Energy Park. Our berth facilities are less than 0.8 miles apart by river making it easy to transfer loads between the two sites. Heavy load routes of approximately 0.8 miles link our quay facilities at Offshore Technology Park and Neptune Energy Park. These strategic load routes provide a cost-effective and efficient solution to the transfer of reels or equipment of up to 400-ton by road. In addition to our extensive quayside storage, we offer vast paved, concreted and open storage rental facilities for short, long-term and bespoke periods. Shepherd Offshore provides support services and management throughout the period catering to all client product and equipment requirements. Measuring 217m x 32m, our dry dock facility at Neptune Energy Park is one of the largest on the east coast of UK and positioned within a world-class manufacturing cluster. The dry dock has been used for a series of successful projects in recent years, which saw the full capabilities of the facility in use, with the support of our experienced team. Shepherd Offshore is a global provider for our clients. We have a proven track record in the storage, management and handling of client equipment, before its deployment or shipment. 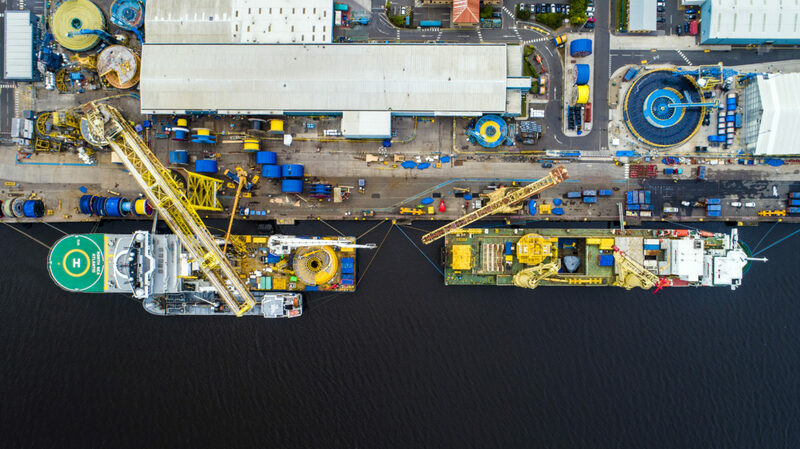 We offer a full range of lifting, handling, marine, warehousing and storage services at our Offshore Technology Park and Neptune Energy Park, which have over 5 hectares of quayside storage. Our logistics division includes both our in-house transport fleet and warehousing and storage provision. Our capacity includes transport for normal and abnormal loads and the transfer of equipment by road, sea and air. Heavy abnormal load routes service both Neptune Energy Park and Offshore Technology Park and provide direct access to major trunk roads, allowing the transfer of products of up to 400-tons.